Plot. Income: 5. Initiative: 2. Claim: 1. Reserve: 5. Plot deck limit: 2. Card abilities cannot cause characters to enter play. All Men Are Fools #19. Ambush is a card ability, so it cannot be used while Barring the Gates is the revealed plot. Here to Serve doesn't provide an option to add a Maester character to your hand. You may look through your deck, and you must shuffle it, but that's all. 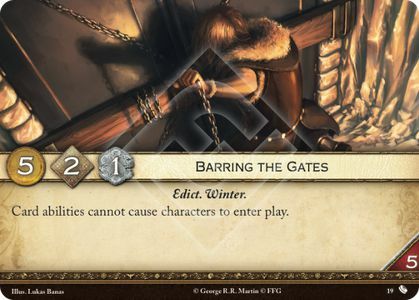 Barring the Gates does not prevent characters removed from the game by Mace Tyrell, Journey to Oldtown or Coldhands from returning to play. It's an expiration of a lasting effect, not an active "cause". Barring the Gates prevents characters from coming out of shadows.